What is accepted is not always efficient. So how do we get ourselves, and others, to higher levels of efficiency without placing them, or ourselves, under more pressure than it is worth to achieve? This article touches on aspects of dancer motivation and is relevant to this blog’s focus. You can find the article here. If you have comments that are relevant to this blog, feel free to comment here as well as on Jonathon’s article. Although there is a particular “look” of a classical dancer – slim body, long neck, legs, and arms, arched feet and open hips – what is a dancer but a human being, and each of us is unique. It may not be immediately evident in a line of corps dancers in a traditional classical ballet company’s production of Swan Lake, but if you look closely enough or watch each of those dancers in class or rehearsal I guarantee you will see distinct qualities not only in their bodies, but in their approach to movement. In other ensembles, the variety of physicality is a key element to the aesthetic. Given the unique qualities of body and movement, how does a dancer find the right place for his or her career? I took a quick dive to explore this through live interviews with several professional ballet dancers of varying backgrounds, supplemented by online videos and my own experience. While it is not an empirical study by any means, it has given me precious insight into one of the key factors that makes or breaks a dancer’s motivation to carry on. What I came away with is that the journey of finding one’s own place is ultimately less about fitting in to a particular company or style; it is about trying on different “skins” – whether artistically and culturally – and asking oneself the difficult question of whether the current job is right. In the stories these dancers shared with me, I heard the following thematic questions emerge: What is my own skin: my internal artistic style and personality? Where can I be in my own skin and still have a fulfilling, ever-growing, and collaborative experience? I’ll share these stories with you in a multi-part series, since each dancer is an instrument and vehicle not only for an artistic director or choreographer’s vision, but for his or her own self-actualization. I believe they deserve to be heard one at a time, to further convey the sense of individuality. In her fifth season dancing with Ballet San Jose, this bright-eyed dancer is pint-sized but dances with an expansiveness that makes her limbs appear miles long. “There are very limited opportunities for the serious ballet student in Japan,” she laments, and in her mid-teens Ige left for northern Germany to further her studies. While she consistently received top marks at the academy, when it came time to find a job she came out empty handed time and time again. After a huge effort auditioning in some eight countries in Europe, Ige headed back to Japan – the worst possible outcome for her – dejected and lost. At Ballet San Jose, she was encouraged upon seeing dancers of different sizes and heights. When then artistic director Dennis Nahat told her that he saw artists and not just bodies, she felt hope. When she was offered an apprentice contract four years ago, she took it and never looked back. 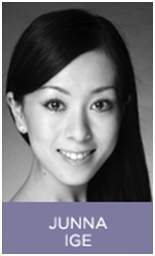 This fortunate circumstance has allowed Ige to gain confidence as a person and as a dancer, and it has paid off: she was promoted towards the end of the last season and is now a soloist with the company. And, this year she carried the tremendous pressure and privilege of dancing the lead character of Kitri in Wes Chapman’s production of Don Quixote on opening night, partnered by no less than international superstar José Manuel Carreño. She pulled the full-length ballet off with determination, sass, and showed us glimpses of pure abandon. “I love it. Why? It’s the dance,” she says in her lightly accented English. Her eyes sparkle, and she doesn’t need to say any more. She’s found her home. Jessica Wallis is the founder of Ballet in Cleveland, a classical ballet presenting company in Cleveland, Ohio. Her mission is to share the wonder of ballet with both boys and girls of all ages. Ballet in Cleveland is working on a presentation with the New York City Ballet in June. One of George Balanchine’s most popular quotes is, “Ballet is woman.” With this quote, Balanchine aimed to highlight the long lines and artistry found when women danced on pointe, as paired with the delicate curves of their lean muscles, and even hair, as Balanchine ballerinas often had long hair that he occasionally called for them to wear loose during performances. Although Balanchine was certainly not amiss by highlighting the elegance and femininity inherent in ballet’s nature, he also did an effective job of choreographing steps that showcased the athleticism of male dancers. As society changes and we begin to broaden our scope of accepted norms, I must stop and think about the place of “boys in ballet”. This weekend our non-profit classical ballet presentation company, Ballet in Cleveland, will have a table at a fundraiser for another local nonprofit, Art Sparks. We will be donating a Ballet in Cleveland t-shirt, a pair of decorated pointe shoes, and a scholarship to a master class with celebrity ballerina Allison DeBona in March. After I thought about what we would donate, I had a moment of pause: What if a boy receives the gift? A boy wouldn’t want a pair of pink pointe shoes. Immediately I pulled one of our black shirts to package as part of the gift, and began to re-think of what we could offer instead of pointe shoes. Even me, an individual who has had involvement with ballet for over 25 years, with a (hopefully) progressive attitude toward the art, had immediately defaulted to catering the gift to a young girl, and not a boy. In a recent 60 Minutes segment by Lesley Stahl about NYCB, I was pleased to see that males were primarily featured. A few minutes into the piece, Martins was shown encouraging and congratulating young boys backstage after a performance, He reminded them not to be “mechanical”, and coached them on musicality, one of the elements that sets NYCB dancers apart from those in other companies. Principal dancer Robert Fairchild was also featured. The piece showed Fairchild’s triumph during his first performance of Balanchine’s masterpiece, Apollo. The portion about him began with his description of being teased when he was young because he was the only boy in his ballet class. Sound familiar? He goes on to say that it was difficult to endure, but that if you love something so much, you have to follow it no matter what. And good thing he did- Fairchild is one of NYCB’s finest dancers who made his way through the ranks of the company very quickly through hard work and dedication to his art. What a role model, especially for young boys with an affinity for ballet. All in all, I was struck by the fact that 60 Minutes chose to showcase young boys backstage as well as a young man in a leading role, with minimal costuming and no set, and not the typical ballerina in her jeweled tutu and crown. That said, I value and appreciate the role of the ballerina and do not wish to downplay the huge part that female dancers play in ballet. Rather, I was glad to see that the focus for this piece was on a male artist and the significance of his debut in a role, and not the typical glitz and glam that is often associated with ballerinas and marketed to the masses. It is worth noting that George Balanchine, known as “the father of American ballet” was reluctant to take ballet as a child, and didn’t even have a particular interest in it. However his mother loved the arts and had the young George audition with his sister, who shared her mother’s passion for ballet. In Russia, ballet does not have the stigma for boys that it has in America. Ballet is something revered, and involvement in it is looked upon honorably for members of both sexes. So as social norms and stigmas change, and we function under an administration that welcomes and promotes equality, let us hope that with this comes many boys in many ballet classes and debuting on many stages… even if they were dragged in by their sister or their mother to begin with. Jonathon Levy is a former principal dancer in the USA, and Ballet master both overseas and in the USA. He has owned his own studio, and works in the field training young aspirant dancers. When he owned his school, his company was the subject for a thesis on Business management (BS in BusAdmin/NfP), following the Schein organizational ideology for corporate development and internal-culture. Ballet Training Centre at www.RVCArts.org The following post was originally submitted by Jonathon as a reply on my Research Purpose page. I pursued the “to be a dancer” idea after I got some positive feedback from girls in high school, yet then after about four months and going to a real summer intensive program, a real ballerina and a principal male dancer looked at me and said: “do you want this as your career?” I didn’t think about it, I just said “how?” – That was the moment I “made the decision” to become a professional dancer. I think I was still trying to ‘become a professional dancer’ when I retired twenty years later as a principal dancer (and Guest Artist) from what was considered one of the top 15 or 20 companies in the USA. For me motivation was never the idea, or should I say the idea of motivating myself was never an issue… I made the decision and I just never stopped confronting myself with the fact that I made the decision, there was nothing else – I didn’t have a supportive family, I didn’t have any “safety-net” – in a very real way it was all I had so I just figured I had to do it… so I did.